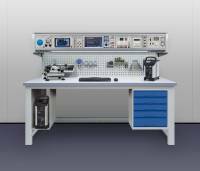 CalBench is a custom built work station for industrial test facilities and calibration laboratories. A wide range of modules for calibration of electrical, pressure, temperature, and loop are available. Further modules and extras such as power supplies, oscilloscopes, and counters can also be integrated. CalBench provides the versatile solution to multi product calibration that meets the highest industry standards.